I came to this book looking for some answers. I’m in my twenties, I have a degree, I’ve been brought up by nice parents, and I have a decent job – but I don’t have a good pension, I don’t own my own home, and my savings are lacking. Apparently this is the fault of the baby boomer generation. They screwed me and thousands of others over. Or so I am told. 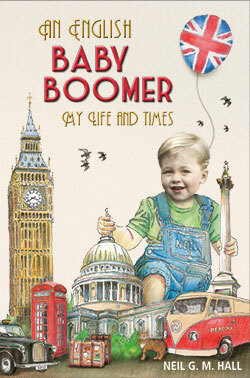 So when a book named An English Baby Boomer – My Life and Times arrived, I hoped that it would reveal a little more about these people, born between the years 1946 and 1964, and what they had that I don’t. The press release and blurb describes Neill Hall as an ‘everyman’ for his generation. An everyman with a privileged background, who was the son of a naval officer, who swans around Knightsbridge, who grew up with servants, was educated at Marlborough College, who lived his formative years in India and other places hugely exotic for most now, let alone in the 1950s, and has made millions as an entrepreneur, creator, and twenty seven years in financial services. Not for him a life of the doldrums. A quote from Ranulph Fiennes on the cover is a result of a personal association. But that does not mean it’s not interesting. Far from it – money does not beget, but certainly allows for, a life full of wonderful opportunities. He’s had some amazing experiences, and tells some of those stories in this book, particularly when it comes to his travels, such as a journey up the Khyber Pass in 1990, hanging out with hippies in Paris in the eighties, and an escape to Istanbul. Insight into a life in finance intersperses chapters about family and friends, and the sensitive and caring tone with which Hall refers to his loved ones is endearing. London in the sixties is described with flavor, and his early years at school evocative of Roald Dahl’s Boy. At times the author veers on clichés, lamenting the politically correct environment he finds himself in, and harking back to ‘good old days.’ ‘Today you can’t have that kind of fun’ he complains. But preconceptions are challenged, particular when it comes to his mystical wanderings and a quest for something outside of the concrete – something not usually ‘characteristic’ of baby boomers. The 380 odd page book is very much a man’s memoirs rather than a fascinating must read. It’s hard to lose the voice in the head wondering why you are reading about this particular man, rather than any other. Which opens up a whole new set of questions around why we find certain people’s stories more fascinating than others. What a celebrity has for breakfast is dull and futile compared to the stories of many ordinary people – and it’s clear that Hall has plenty of stories – so why do we feel more comfortable reading the autobiography of people we think we know? I came looking for answers, and ended up with more questions. A book stimulating curiousity – the mark of a good read? Next Is Social Media Killing Literature? Thank you so much for your heartening review. It was really interesting to hear from someone so young and to reflect on your thoughts. It would be great to hear more from you.